The Centre for 21st Century Humanities has kicked off a program to nurture early career researchers (ECR’s). Five ECRs have been selected to participate in the program that will see them mentored by senior academics and up-skilled in the growing area of digital humanities. 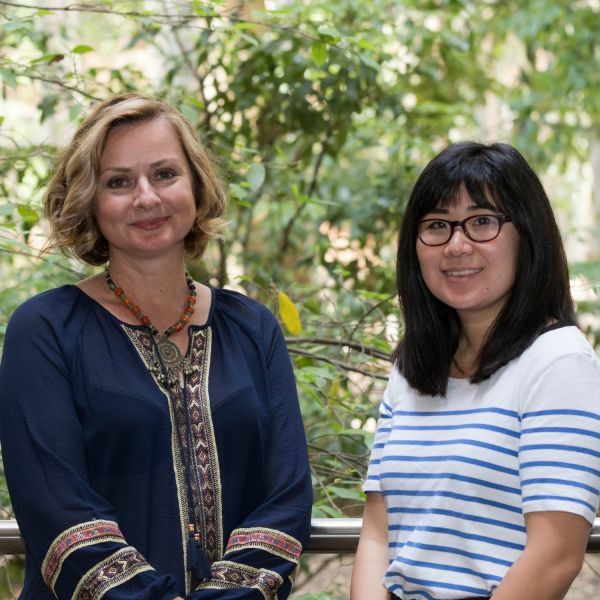 Dr Bernadette Drabsch of the School of Creative Industries, left, and Dr Akane Kanai of the school of Humanities and Social Science are among the five ECRs in the program. Deputy Director of the Centre for 21st Century Humanities, Associate Professor Ros Smith is coordinating the program and is thrilled with how it’s going so far. “I was pleasantly surprised to hear what they wanted most was to be exposed to and to be able to draw on the collective wisdom and knowledge of our more senior academics. They weren’t particularly looking for funding,” Associate Professor Smith said. They will also receive tailored support to apply for Discovery Early Career Researcher Award (DECRA) funding, and will attend a Digital Humanities Workshop in December, something history ECR Dr Kate Ariotti, is looking forward to. “The workshop will cover topics such as text mining, digital mapping and digitisation of cultural heritage. I'm really excited to learn how to implement these kinds of digital tools into my research as I've seen first-hand through Professor Lyndall Ryan's 'Mapping Massacre' project how they can transform historical analysis and how they can expand the potential audience for academic research,” she said. Associate Professor Smith said each of the ECRs is linked with a mentor from outside their discipline. “They all wanted to have that informal connection with a senior academic so they can have an ongoing conversation about how to further their careers,” Associate Professor Smith said. Dr Ariotti says the benefits are many and varied, ranging from access to skills-based workshops, engaging in interdisciplinary work, and learning how best to prepare grant applications. “One of the things I'm very much looking forward to is conversations with my mentor, Professor Hugh Craig. Being able to talk through things like funding applications, publication options, and how to strategise for a future in academia with someone who has experience and who can offer different perspectives is extremely valuable,” Dr Ariotti said. ECR in Sociology, Dr Julia Coffey says the program has been enriching and inspiring. “As a female ECR, it is really useful to be mentored by a senior woman outside of my discipline to give a broader perspective on research and career development. It is great to hear how other people work, and to hear advice on their ways of working and prioritising different parts of their work,” Dr Coffey said. Sociology ECR Dr Akane Kanai says she’s grateful for the opportunity to have a formalised structure of mentorship. “It's not necessarily intuitive as an ECR to navigate the university as a large institution, and so it's really useful to understand how the university operates through the perspective of senior academics in the Centre. My assigned mentor is Professor Lisa Adkins, who is a global leader in social theory, and our conversations really help me to think about big questions and why and how I do research,” Dr Kanai said.